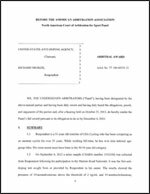 USADA announced today that the independent American Arbitration Association/Court of Arbitration for Sport (AAA/CAS) has issued a written decision that Flavia Oliveira, an athlete in the sport of cycling, committed a doping violation and will receive a two-year suspension for the offense. Oliveira, 28, of Livermore, California, provided a sample on June 19, 2009, after the second stage of the Giro del Trentino Donne, held in Italy. The sample resulted in an adverse analytical finding for oxilofrine, which is in the class of stimulants and prohibited under the USADA Protocol for Olympic and Paralympic Movement Testing and the rules of the Union Cycliste Internationale (UCI), both of which have adopted the World Anti-Doping Code (“Code”) and the World Anti-Doping Agency Prohibited List. Oliveira’s two year period of ineligibility began July 19, 2009, the day her sample was collected. As a result of the doping violation, Oliveira has also been disqualified from all competitive results achieved at and subsequent to the Giro del Trentino Donne, including forfeiture of any medals, points, and prizes. The independent arbitrator also found that the source of her positive test was a supplement product, Hyperdrive 3.0, which the manufacturer confirmed contained the prohibited substance oxilofrine. The decision also finds that significant fault existed on the part of the athlete for the presence of the substance in her system. In December, USADA, in partnership with the NFL, MLB, NBA, NHL, and the USOC, launched Supplement Safety Now, as an effort to end the dangerous and unscrupulous practices of some manufacturers within the nutritional supplement industry. Supplement Safety Now is urging Congress to establish a regulatory framework that ensures that all supplements sold over-the-counter, in retail stores and online, are safe and free of dangerous steroids and other drugs. In an effort to aid athletes, as well as all support team members such as parents and coaches, in understanding the rules applicable to them, USADA provides comprehensive instruction on its website on the testing process and prohibited substances, how to obtain permission to use a necessary medication, and the risks and dangers of taking supplements as well as performance-enhancing and psychoactive drugs. In addition, the agency manages a drug reference hotline, Drug Reference Online (www.GlobalDRO.com), conducts educational sessions with National Governing Bodies and their athletes, and proactively distributes a multitude of educational materials, such as the Prohibited List, easy-reference wallet cards, periodic newsletters, and protocol and policy reference documentation. USADA is responsible for the testing and results management process for athletes in the U.S. Olympic and Paralympic Movement, and is equally dedicated to preserving the integrity of sport through research initiatives and educational programs. Anti-doping news and information for those who value clean sport. USADA's scientists answer important science questions. #AskingForAFriend: "My teammate said I can take pseudoephedrine tonight because it will be out of my system by the time we compete tomorrow. Is that true?" Comment below with your #antidoping question for Dr. Matt!